But this is a safe, pale pinky shade with a bit of a nice shimmer to it. It’s an easy one for an all over was of shimmer (with eyeshadow primer underneath). As with all Estee Lauder Shadows I have tried to date, this is a great, reliable quality shadow with good pigmentation that is silky smooth to apply – plus the added touch of luxury thanks to the gold packaging. Highly recommend them if you see a shade you like, you can be pretty confident that it will be a good purchase. I couldn’t find the shade on the Estee Lauder website but it was on Harrods, priced £15.50. 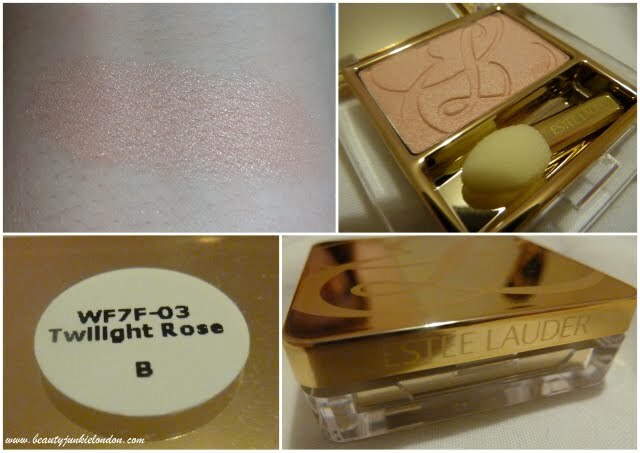 This is such a gorgeous shade, and it looks like it could double up perfectly as a highlighter and a blusher! That colour is so lovely! I haven’t tried EL eye shadows before but a few bloggers did write about them and they seem so lovely!